We come across situations where organizations prefer to hire professionals to fulfill short term requirements (Contract Staffing Services). However these requirements are critical for the organizations growth and success. Finding and recruiting highly professional and experienced candidates on a contract is vital for meeting such requirements . CONNECTING2WORK’s huge database of prescreened experienced candidates across all industrial Verticals and functional areas make us your ideal choice for contract hiring. Such contractors will be working as employee of CONNECTING 2 WORK at our client offices. 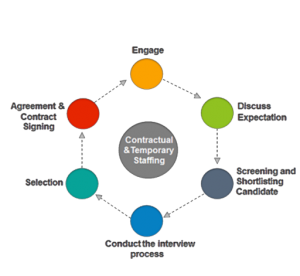 CONNECTING2WORK’s Contract-to-Hire staffing services offer an opportunity to business enterprises and organizations to effortlessly increase head count quickly and effectively to meet the demands of growing business. With C2W Contract-to-Hire Staffing Services, employers also have the opportunity and flexibility to monitor the performance of a short-term consultant, and then offer a permanent position to them, and thus avoiding risk of a wrong-hire. CONNECTING2WORK Staffing Solutions is a one-stop solution for all your contract-to-hiring and Temporary staffing needs. We carter the best resources for you Technical (IT) and Non Technical (Non IT) manpower requirements. We work like an extension of your team and ensure the results are delivered to meet your manpower requirements. The undertake the responsibility of finding to On-boarding engagement. Interview co-ordinations, salary discussions, offer management are all part of the responsibility that you undertake on your behalf to ensure a wonderful Hiring experiance for you. Control of Costs: The rates charged will always be a competitive marketplace rate -not an inflated or long service salary rate, with all the associated ‘add-ons’. Cost Effective: The hours actually worked, are the only hours charged to the client. The agreed rate is an all-inclusive rate. Ramping- up & Winding Down: Fast start-up and wind-down to accommodate seasonal or market fluctuations, one-off or unplanned projects, etc. Wind-downs can be accommodated with ease. 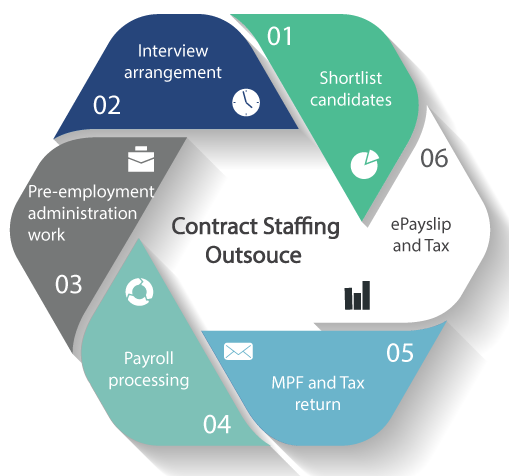 The numbers of contract staff can be increased or reduced at short notice, thereby keeping pace with the changing needs of the business. Maximum Flexibility: No Demarcation, flexible working hours, unrestricted work practices and ongoing acceptance of new technology, generates increased productivity and reduced costs for the Client. In addition, the resources needed are available when needed. No Redundancy Payments: The client is not liable for redundancy payments to contract staff on completion of contract. Saving on Administration/Payroll/Accounts Time: The need for administration, payroll and account time is almost eliminated. Well Motivated Staff: Contract staff are well motivated, commercially minded with keen business acumen, they bring a positive work ethic and new stimulus to the workplace. 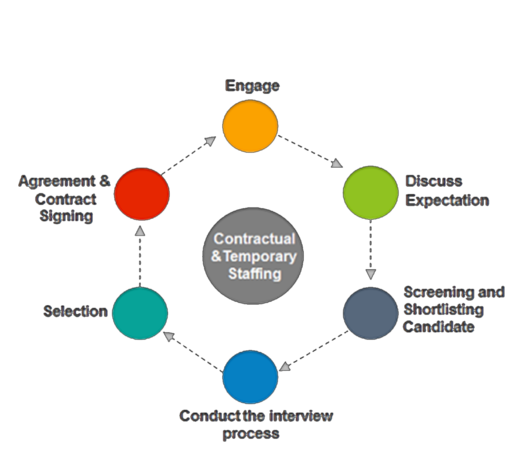 Contract staff is well disposed to ‘change’ and can facilitate and expedite positive change in a Client’s organization. Flexible & Trained Staff: Because contract staff are moving in the market, working in different environments, meeting and solving new problems, their training and development is constantly evolving and being enhanced -keeping up with the rapid rate of change in their specialist areas. Seamless Integration: Contract staff is task orientated, commercial minded and focused – quickly fitting in and being easily accepted by permanent staff.